The cast of HAMLET. Photo by TOMMY THOMPSON. 2005. 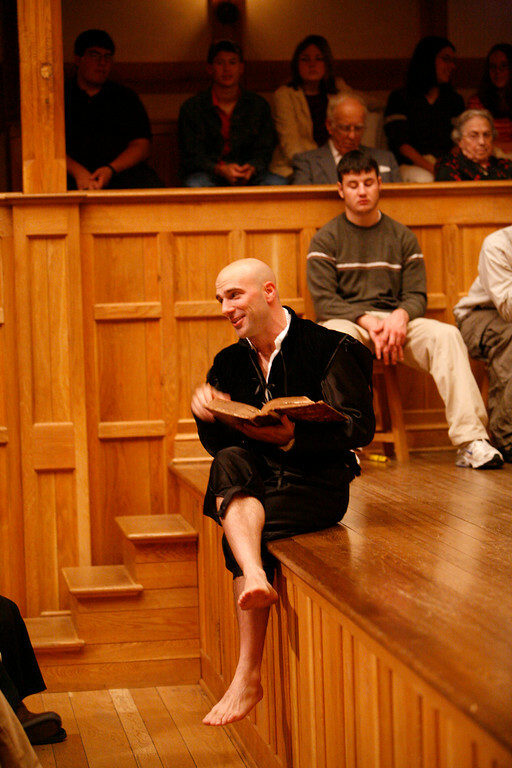 Khris Lewin in HAMLET. Photo by TOMMY THOMPSON. 2005. 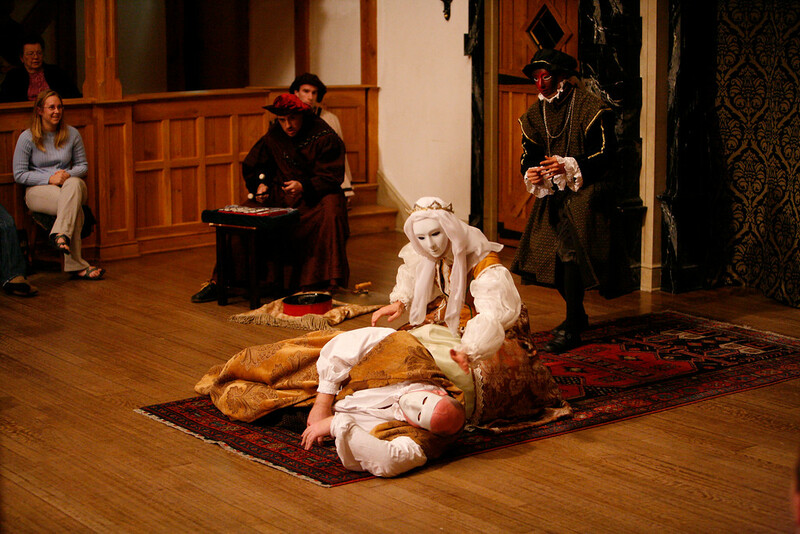 Bernard Bygott, Khris Lewin, and Amy-Kristina Herbert in HAMLET. Photo by TOMMY THOMPSON. 2005. 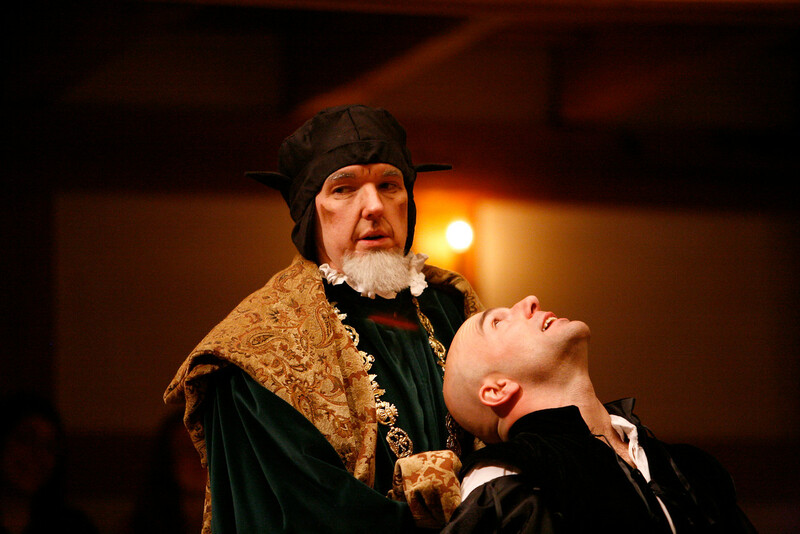 John Harrell and Khris Lewin in HAMLET. Photo by TOMMY THOMPSON. 2005. Matthew Sincell and Eric Schoen in HAMLET. Photo by TOMMY THOMPSON. 2005. 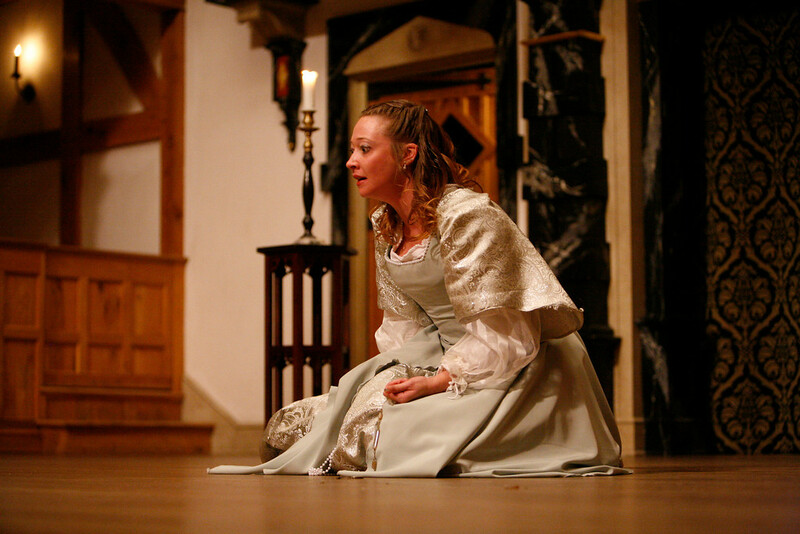 Sarah Fallon in HAMLET. Photo by TOMMY THOMPSON. 2005. Sarah Fallon and Khris Lewin in HAMLET. Photo by TOMMY THOMPSON. 2005. 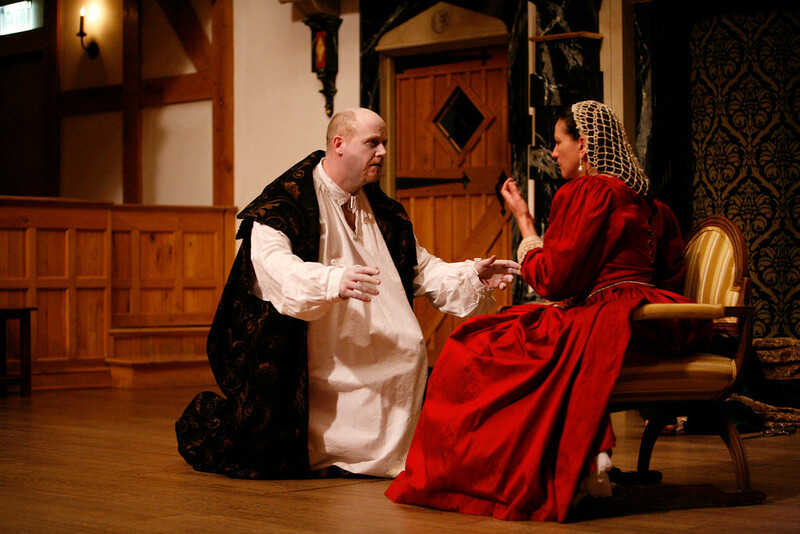 James Keegan and Tracy Hostmyer in HAMLET. Photo by TOMMY THOMPSON. 2005. 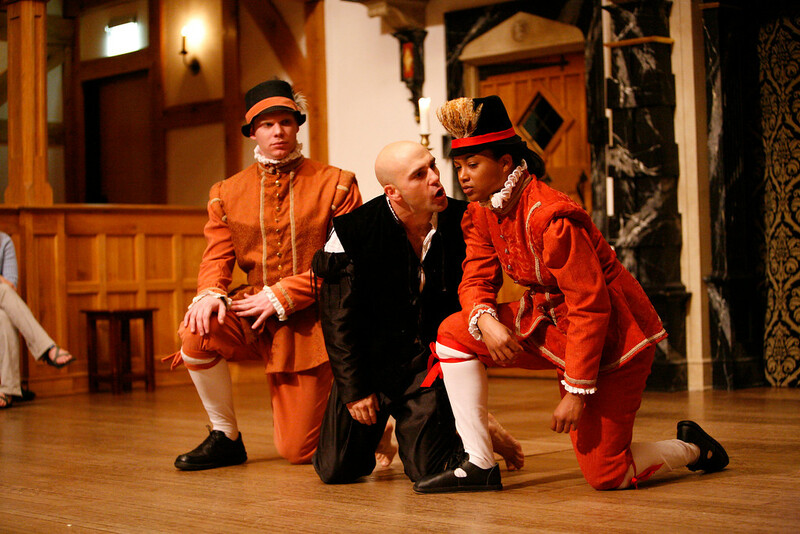 Khris Lewin and James Keegan in HAMLET. Photo by TOMMY THOMPSON. 2005. 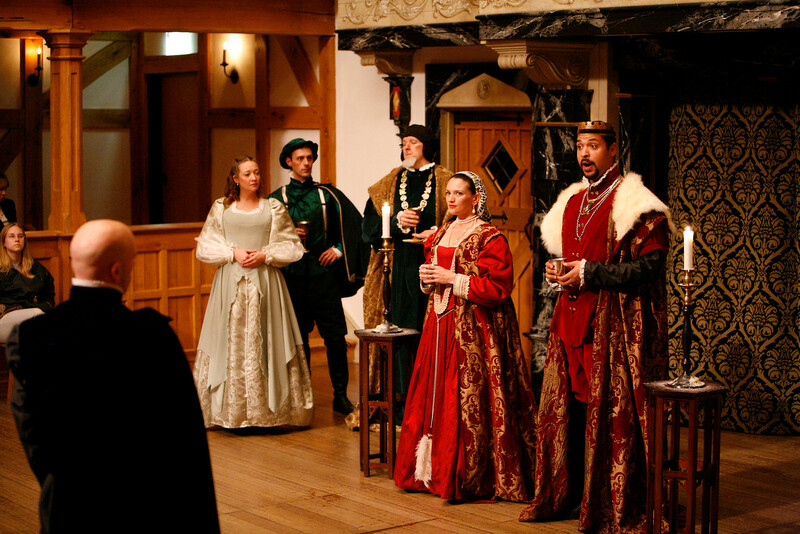 Prince Hamlet returns to court at Elsinore from studying at Wittenburg. The ghost of the dead king appears on the battlements two times. Two soldiers bring Horatio, Hamlet’s friend and fellow student, to the battlements where the ghost appears again but does not speak. Laertes says goodbye to his sister Ophelia and gets much advice from his father before departing for France. Hamlet tells the audience that the players will “play something like the murder of my father.” in front of Claudius because the ghost “may be the devil…and perhaps…abuses me to damn me.” Hamlet will watch how Claudius reacts to the play to know for sure if the ghost speaks the truth. Though it began obscurely enough, Hamlet is inherently a big bang affair, its own constantly expanding universe. The story first appears in Danish at he end of the tewlfth century; in its French translation of 1570 it is already twice as long. 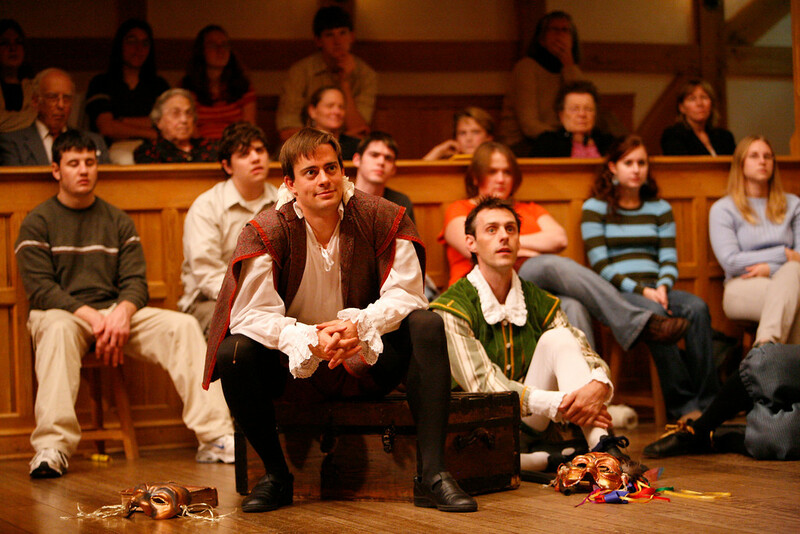 Shakespeare’s famous “good” quarto version, though generally believed to be based on his own manuscript, is much too long for theatrical performance. The Folio version of 1623 is considerably shorter, and is closer to a playing script – yet it also includes many lines which appear for the first time. Even when Shakespeare needed to make his play shorter he couldn’t resist adding to it. In the fifth act, when any reasonable dramatist would be thinking of winding things up, Shakespeare introduces the gravedigger and Osric, two exotic characters that contribute almost nothing to the plot. The playwright postpones his ending almost as long as his prince postpones his revenge. You sense that given world enough and time, they both might have gone on talking forever, and you rather wish they had. Hamlet himself, at the moment of his death, is desperately concerned that he will be forgotten. He needn’t have worried. We have been retelling his story ever since he first expired on the stage of the Globe, not only in stage productions but in films, lectures, critical essays, and conversations in and out of class. As the American Shakespeare Center blurb for this production notes, Hamlet is “the world’s most discussed play.” It is also Shakespeare’s longest, most unstable, and least contained. The overwhelming proliferation of Hamlet, which seems to spill out in every direction, almost demands that any new production create at least a clear and strong interpretation, and preferably a new one, of this most protean play. Alas, that is not what we offer here. Rather than adopting a rigorous point of view, we have chosen to let the playhouse itself serve as the container of this most uncomfortable play. 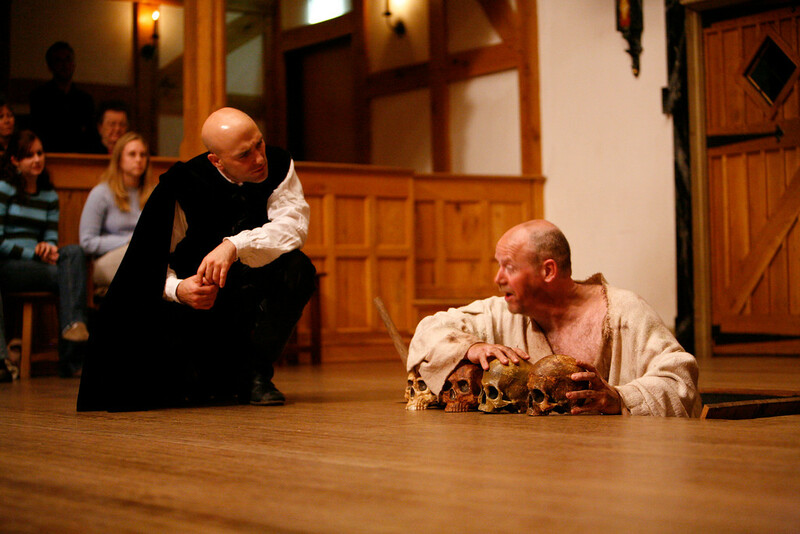 The Blackfriars is not the Globe, but it bears a more than cousinly relationship to Hamlet’s original stage. It opens the doors to a number of possibilities while radically limiting others. There will be no special lighting, no electronic thunder, and no chemical fog to usher in our ghost. There will be only the most minimal indications of place settings. There will be very few supernumeraries – our prince, as he says, will be most “dreadfully attended.” On the other hand we have a space which encourages fluid movement and continuous conversation with the audience. There is one great place to hide, behind a curtain prominently placed upstage. Above, a roof fretted with golden fire. Below, a trap door leading to a cellarage, the fires of hell, an open grave. There’s an upstage wall, both rich and gaudy, a grand façade. Whatever else it is not, the Blackfriars is always dressed, cap a pie, as a theater, a place “to act, to do, to perform.” Why it almost seems as though everything in the Blackfriars was designed to support the action and the world of this play. Amazing, is it not? In the early days of our rehearsals, attentive to the promptings of both play and playhouse, it has sometimes seemed to me that we are as much ritual practitioners as exploring artists. The play is that familiar and that deeply engrained in our consciousness. Hamlet accommodates itself so naturally on this stage that I sometimes think the play has found its home at last, and perhaps now it will settle down to a well deserved rest. Yet even here – perhaps especially here, Hamlet also feels surprisingly fresh and clean. And if there’s one thing we know about this death haunted hyper-alive play (and its death haunted hyper-alive hero), it’s that it will go on expanding and changing. In truth this production only participates in the play’s still proliferating universe. At the heart of Hamlet is a restless, perturbed spirit. The play haunts us like the ghost haunts Elsinore. ‘Tis very strange, assuming a questionable shape to assail our eyes. We go on remembering it so long as memory holds a seat in our distracted globe. And then, perhaps, we forget. But soft, behold, lo where it comes again!